Discussion in 'Canon InkJet Printers' started by mikling, Sep 27, 2017. Think the Pro-100 was a deal? Here this one for ya. A pigment ink photo printer for $99.99 or whatever. use PRO10 in promo code. As of now it is working. Don't know how long it will last. The last time this kind of stuff happened, it was the clear out of the Pro9500. This could signal the sunset of these models and the next one will probably be not as refill friendly. Could be the last chance. If you read this and then pass on it and later on regret it, then we've seen these ridiculous deals before. it's real. Fade tests galore on dye ink and OEM. As Hat has suggested, if you are queasy about using aftermarket dye ink for fade reasons...then there is NO reason to not get this deal at 99.99. Refilling pigment ink while more costly than aftermarket dye will actually outperform OEM dye and still be less expensive. So that Pro-100 deal which might force you to use OEM ink to obtain longevity will be more costly than springing for a pigment ink printer. One of my customers pointed me to this deal because he wanted a second set of carts.....and he also gets a new printhead and a waste ink pad (printer body) in the deal! Update: I didn't see the rebate, which brings it down to about $99. The Hat and apetitphoto like this. OK, in for two...darn it! 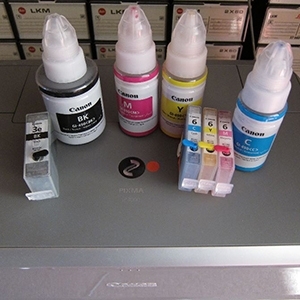 Question on the refills, do I need to empty/flush the OEM inks to use PC or InkOwl 3rd party ink? Or can I add new ink as the OEM carts go low on ink without flushing them? You may want to cancel one of those. Limit 1 claim per eligible product per household, except in Rhode Island.